What is a Line Isolation Monitor (LIM)? 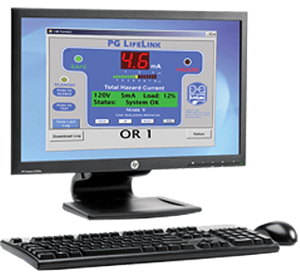 The Line Isolation Monitor (LIM) continuously monitors the Total Hazard Current (THC) of an Isolated Power System in the Healthcare industry. A LIM provides both visual and audible alarm signals to alert medical staff of the presence of a line-to-ground fault on connected equipment. System status and operating parameters are prominently displayed on a large LCD screen. Isolated Power Systems are designed to protect patients and caregivers from electric shock in critical care areas. Line Isolation Monitors (LIMs) are the most important component of all Isolated Power Panels. 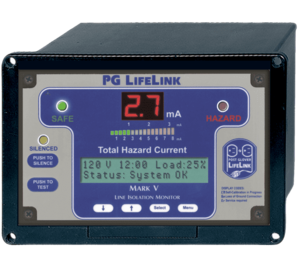 LIMs are the piece of the Isolated Power Panel which monitors the hazard current and alarms if the electrical current has reached a dangerous level. Isolated Power is required in hospital operating rooms and other “wet procedure locations” because if a fault were to occur, the electric current will flow through the path of least resistance. In a “wet procedure location”, patients are vulnerable, critical electrical equipment is often used and fluids are present. This combination creates a dangerous environment should an electrical fault occur. The LIM is continuously measuring the electrical current within the operating room. If the current reaches a dangerous level, the monitor alarms, notifying caregivers of a surge in electric current. In the event of one line-to-ground fault, the Isolated Power Panel provides uninterrupted power and also eliminates the danger of electrical shock. This allows the procedure to continue while keeping patients and caregivers safe. 6.3.2.6.3.1 – "In addition to the usual control and protective devices, each Isolated Power System shall be provided with an approved, continually operating Line Isolation Monitor that indicates possible leakage or fault currents from either isolated conductor to ground." Special protection against electric shock is required by NFPA 99 Healthcare Facility Code and NEC (2014 Edition) to be installed in all “wet procedure locations”. Isolated Power Systems are the preferred method of achieving this protection where power interruption cannot be tolerated. Looking to update your current LIM? Click here for Line Isolation Monitor retrofitting and upgrade services.